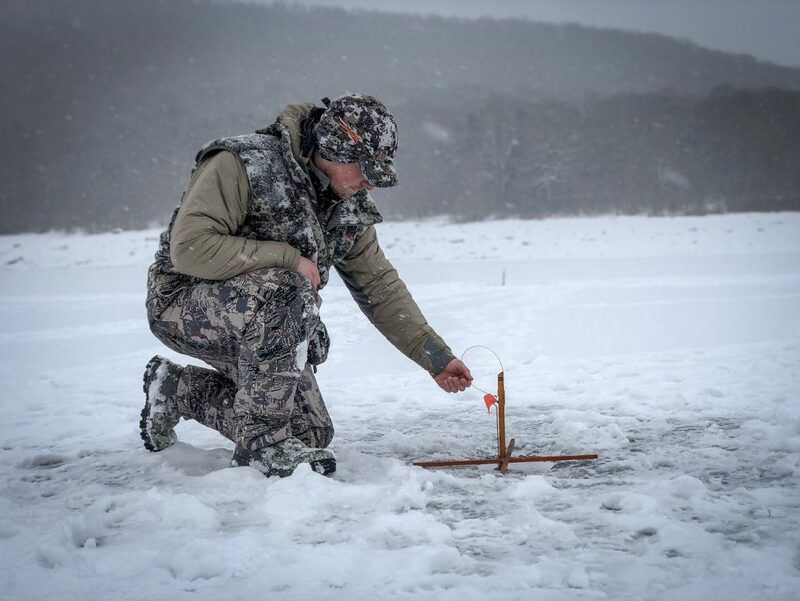 Author Beau Martonik goes ice fishing in the Pennsylvania Wilds. Temperatures are dropping across the state making it easier to want to stay inside, or maybe it makes you want to get outside even more? 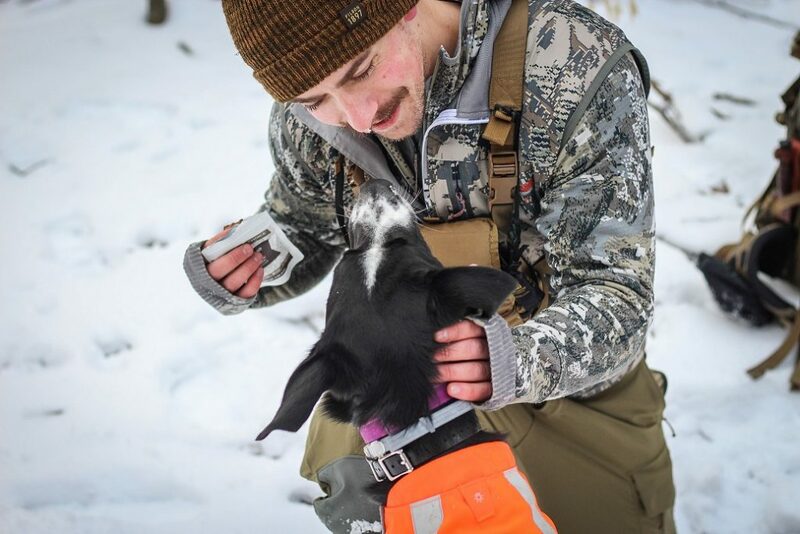 Depends on the type of person you are, but if you are willing to brave a little cold weather, you can still have a great time outdoors during the winter months in the Pennsylvania Wilds! Over the last few years, I have been making it a point to find more to do outside despite the cold weather, and attempt to break free from “cabin fever.” You can find adventure by going camping this winter. I would divide winter camping into two categories. The one that comes to my mind first and is my personal favorite happens to be backpack camping. I would define this as having everything you need to survive on your back, inside of your pack. I usually plan weekend trips like this, where I’ll plan a route on a hiking trail that typically takes two days and stop somewhere to camp after the first day. It’s important to note that not everywhere in the Wilds allows overnight camping along trails. My favorite trail on which to complete a backpack style winter camping trip is the North Country Trail, which runs through the Allegheny National Forest. In the winter, there is potential to hike, camp, and ice fish in the Kinzua Reservoir, all in one trip. The thought of fresh walleye fillets over the open fire is making my mouth water just thinking about it…. This type of camping takes a decent amount of planning, gear and safety precautions to ensure you have an amazing adventure. Water can be frozen in most places, so making sure you have an idea where springs are located (as they’re usually the last to freeze) is crucial. 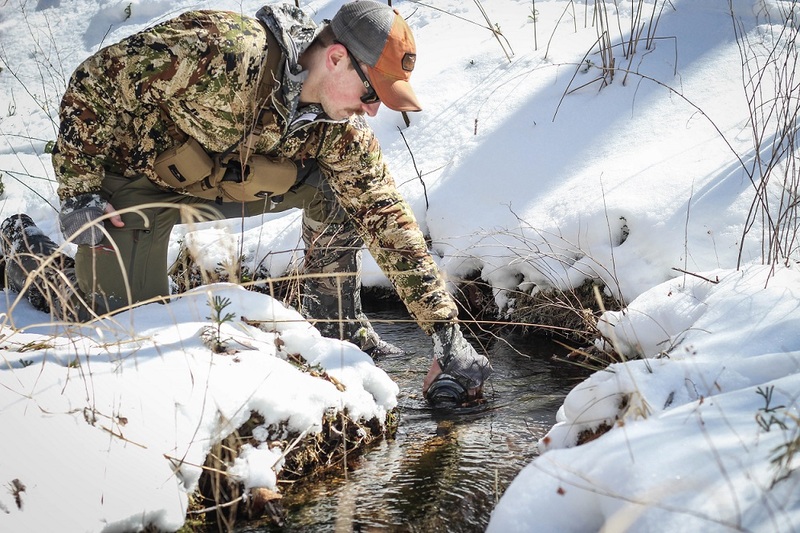 I use my OnX Hunt app to locate small streams and springs in the area that I’m going to. A small auger or something else used to drill through ice can be beneficial to extract water. As is true any time you need to gather water for consumption, you should have a way to filter it to ensure the water is clean enough to drink. Since most filters freeze in cold weather, using Aquamira tablets or something similar would be a safe bet. Hydration is extremely important even in cold weather when you may not feel thirsty. For more information on this, please refer to this other article I wrote specifically on this topic. Camping regulations: As stated above, you need to make sure that you are allowed camping along a trail in the area that you plan on hiking. You can find information on specific areas here. A good rule of thumb is that most Federal public lands (Allegheny National Forest) are open to camping whereas a lot of state lands (Game lands) do not allow camping. There are exceptions to these rules, so make sure to do your research ahead of time. 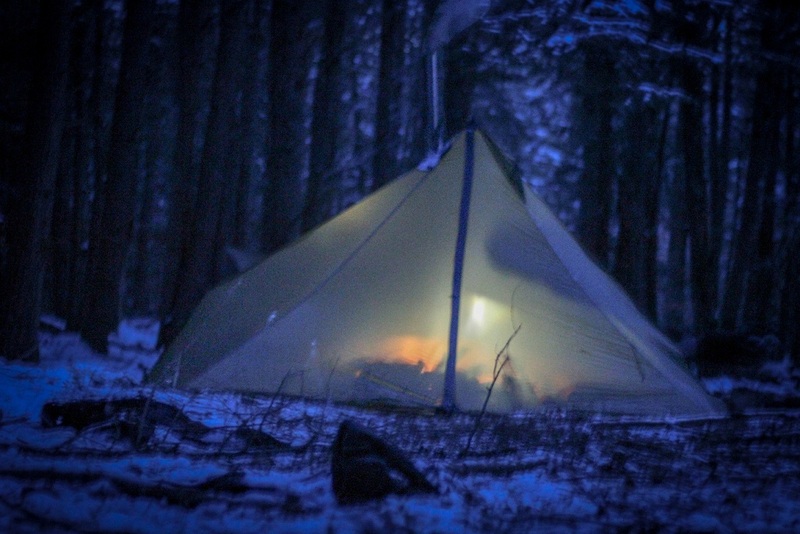 Here is another article I wrote about lessons learned while camping in the Wilds last winter. Author Beau Martonik demonstrates water filtration in the Wilds. The other way to go camping during the winter months that provides security, warmth, and amenities is to rent a cabin in the area where you plan on doing your outdoor activities. This may not be as primitive, but it’s much safer and still allows you to enjoy the experience and activities in a more controlled environment. There are cabins to rent all over the PA Wilds, with my favorite location being in the Benezette area, located in Elk Country. I’ve used websites like VRBO to find getaways throughout northern Pennsylvania, and there are several bed and breakfasts or inns in the region. 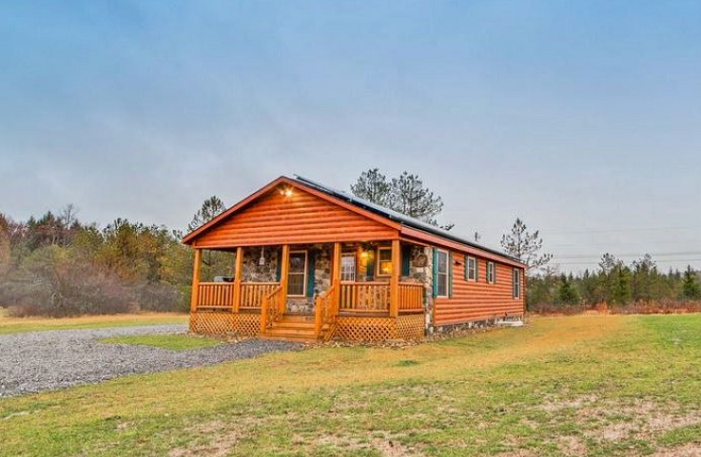 Usually you can get a much better deal during the off-season than you would during the summer and fall months, so it can be a great time to score on a cozy cabin for you and the family. The negative to renting a cabin is that there are additional expenses that you wouldn’t incur while primitive camping. As with everything, there are pros and cons to both. Author Beau Martonik is pictured while hiking with his dog. Overall, if you define what you want out of the experience, you can choose the type of camping or lodging that is right for you. With a little planning, you can have a great weekend with friends and family, enjoying the outdoors while getting away from the hustle and bustle of everyday life. For me personally, it can be the “reset” button I need to get through the winter months. Get outside and enjoy what mother nature has to offer!